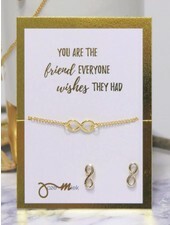 This super cute card with a 14K gold chain with an infinity sign you must have! The necklace is made of 14k gold and is very nice to combine with other gold colored chains. Combine the necklace with gold jewelry to complete your outfit. This super cute card with 14K gold chain with square you must have! The necklace is made of 14k gold and is very nice to combine with other gold colored chains. Combine the necklace with gold jewelry to complete your outfit.